This is mainly for family members, so I won’t mind if other readers move on to something else. So the folks can see what kind of place Leive & I moved into last December, here is the third in a series of pages featuring photos of the house. 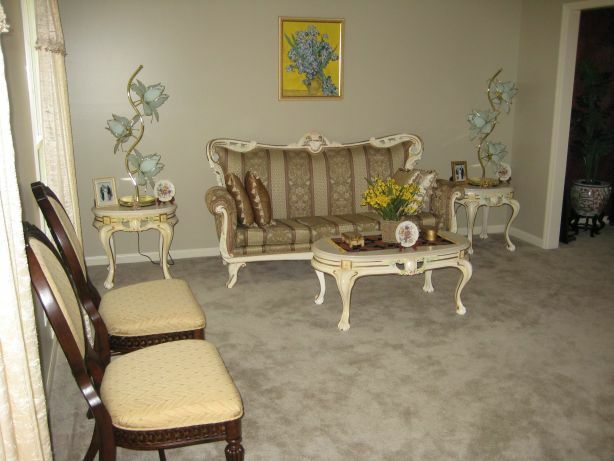 Here is what you’ll see first as you step through the front door: the entrance hall. At the end of the hall is our kitchen. On the right is the stairway leading to the top floor. 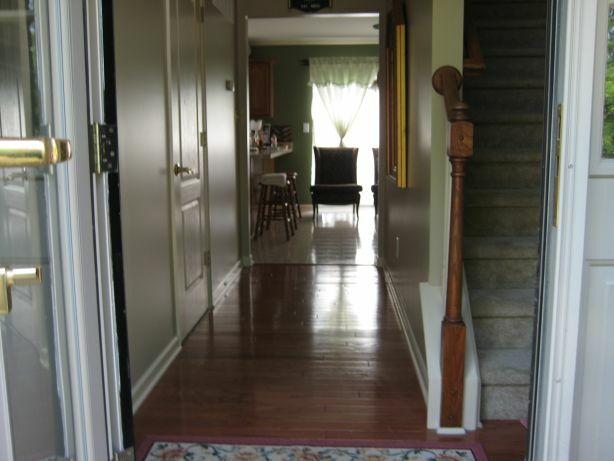 To the left (close) is the way to the living room, and the door (halfway down the hall) to the smallest bathroom. Another view of the entrance hall, this time seen from the other end. Now you can see the mirror opposite the bathroom door, which wasn’t visible in the last picture. We found Leive! 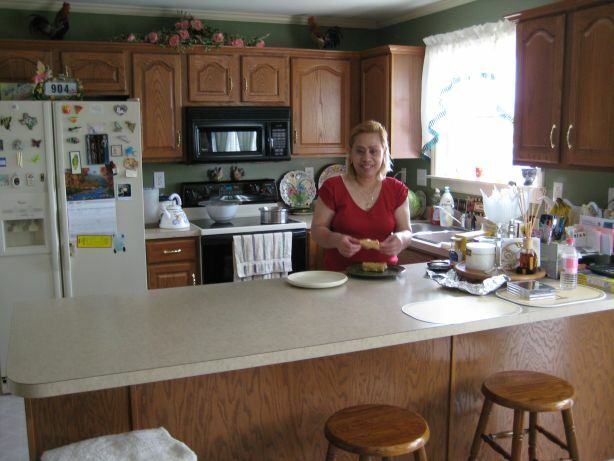 Here she is in the kitchen, putting some lumpias on a plate for lunch. Yummy! Note the fake flowers and chickens on top of the cupboard; Leive is still a decorator at heart. 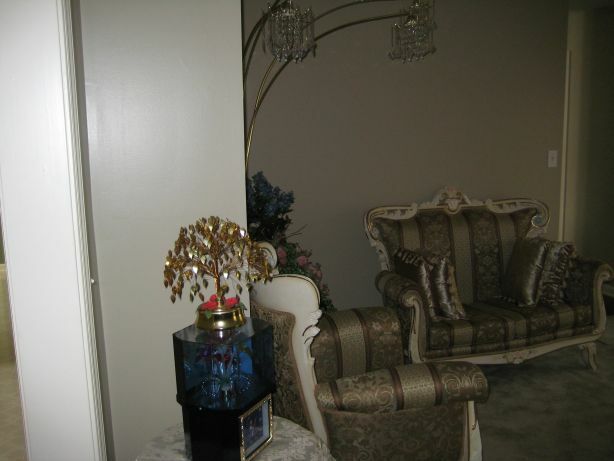 This is the living room, as seen from the front door. 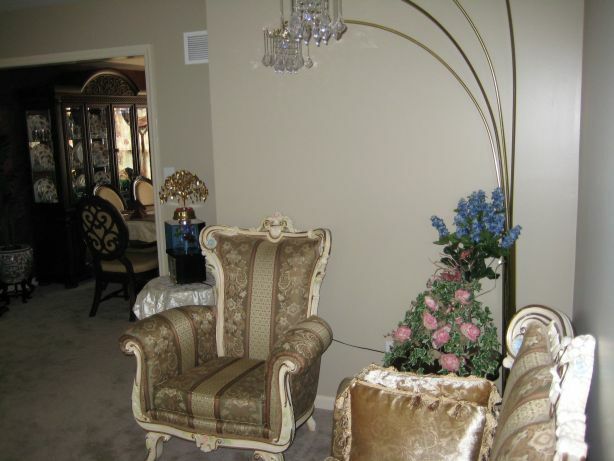 A lot of the furniture we brought up from Florida went in here; you’ll probably recognize it. 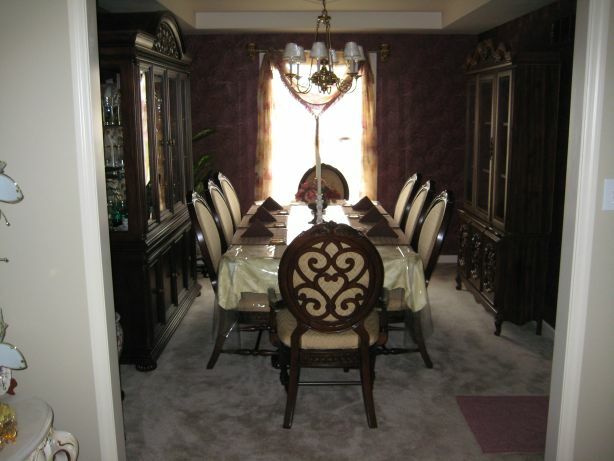 On the other side is the entrance to the dining room. Turn a bit to the right from where you were standing in the previous picture, and you’ll see this. Just thought you’d like another look at Leive’s artistic touch. Another point of view for the living room, this time seen from the dining room. Another view of the living room from the dining room, this time with the camera turned to the left (maybe I should learn how to make some of those 360-degree Quicktime pictures). You probably recognize the fiber optic lamp and the gold tree music box from our decorations in Florida. 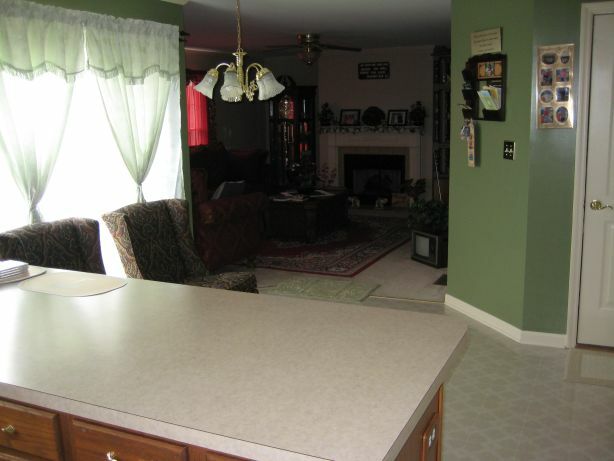 Immediately off the left edge of the picture is the entrance to the kitchen. 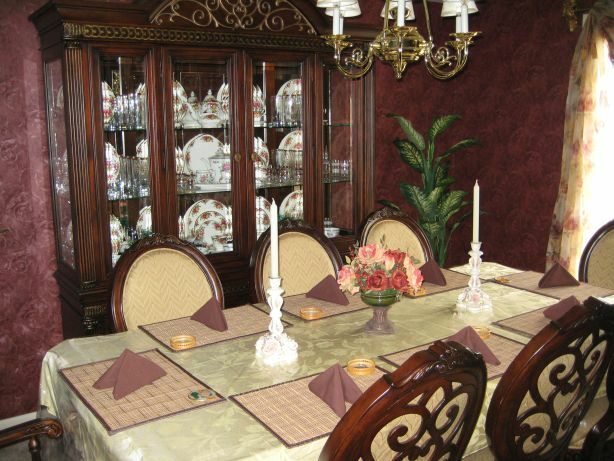 This is the dining room, seen from the living room. It’s a little cramped right now, but hopefully it won’t stay that way for long. We’ve got two China cabinets in there, and the older one on the right, which came with Leive from Florida, will go in the basement when we’ve made room for it. Another view of the dining room, as seen from the entrance to the kitchen. 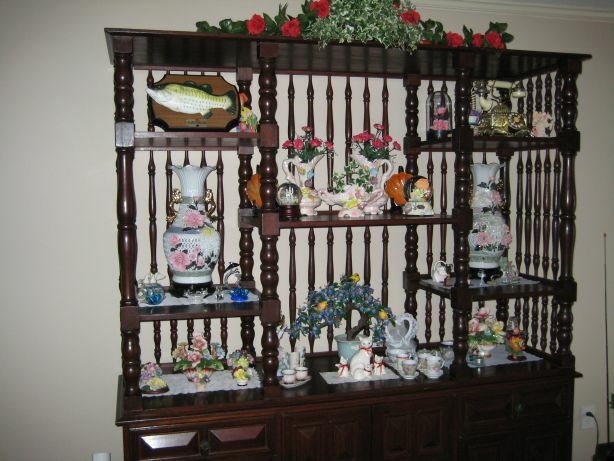 Here you get a better view of the new China cabinet, as well as Leive’s table arrangements. The view from behind the kitchen counter. The two doors to the left of the entrance hall go to the basement and the garage. 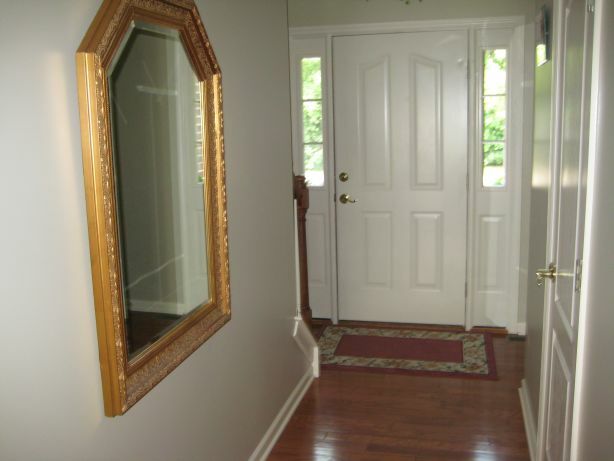 The door on the right leads to a coat closet. 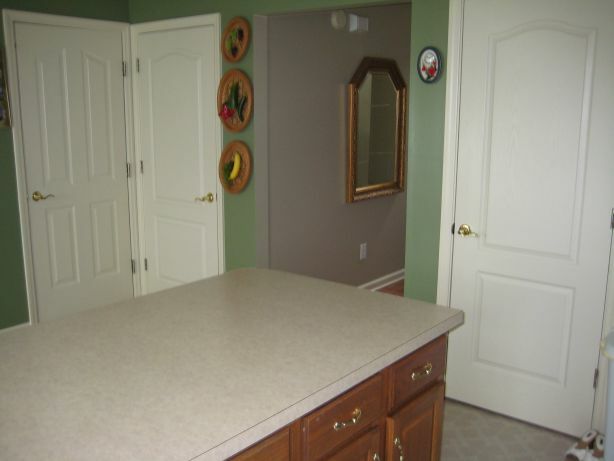 Off the right edge of this picture are a pair of doors leading to a pantry. Looking toward the family room from the kitchen. On the right we see the garage door again. 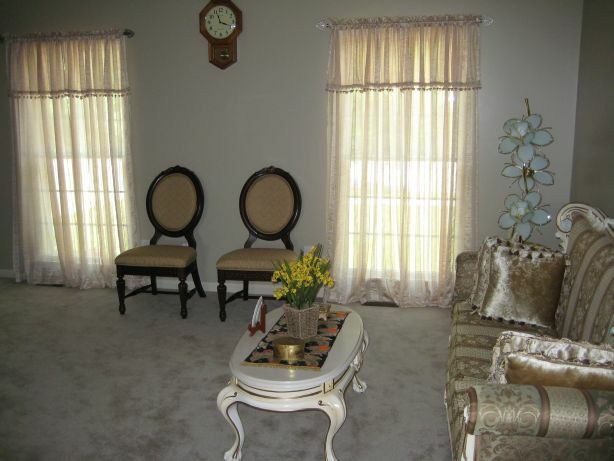 On the left, behind the curtain, are sliding doors that open to the outdoor patio. 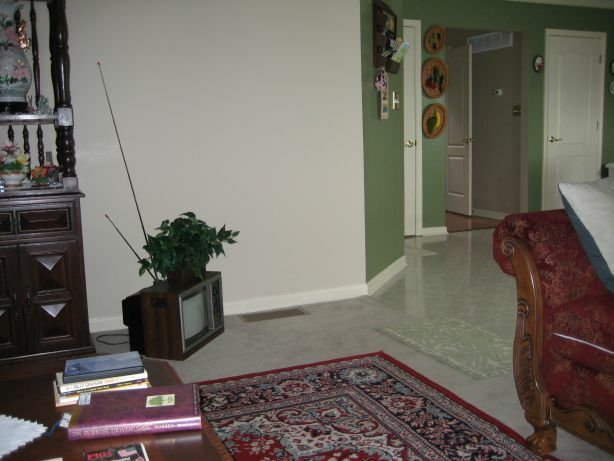 The empty space in the middle will be filled by a country-style table that we ordered; sorry it hasn’t arrived yet. 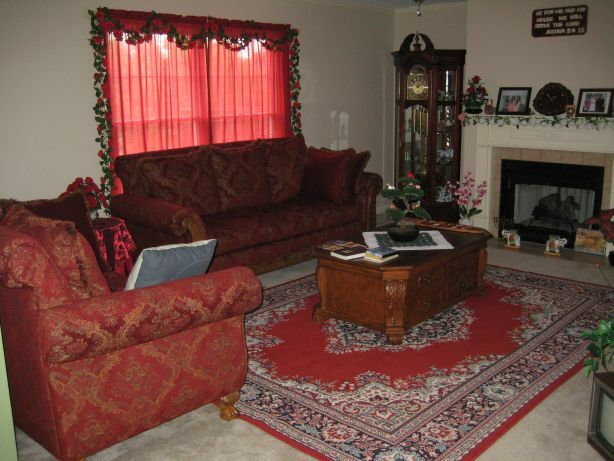 The left side of the family room. You can see our grandfather clock in the background. On the coffee table are a few books, Leive’s sungka board with shells, and a fake bonsai tree with some silk birds on the branches. 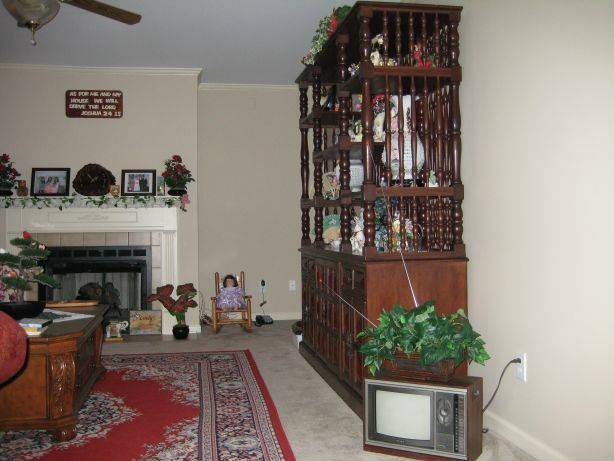 The right-hand side of the family room, showing our TV set and the mahogany entertainment center, the largest thing we brought up from Florida. Looking out of the family room, toward the kitchen and entrance hall. I don’t think I need to say any more. 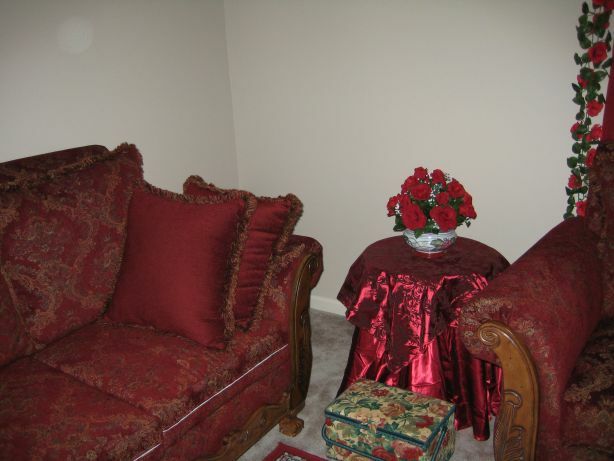 This corner can only be seen when you’re in the family room. Leive made the flower arrangement herself. Sometimes I get the feeling that I married the Philippine Martha Stewart! One more view of the mahogany entertainment center. I’m sure you recognize our Big Mouth Billy Bass at the top left. In the center, where we used to have a TV set (the one that didn’t survive the move up here), we have a glass tree you may remember from Florida, now decorated with three silk goldfinches. I’m a food entrepreneur (best described by homemade charcoal-baked authentic Italian Pizza and Wagyu Shawarma) and I’m the youngest Desk Editor at Manila Bulletin. 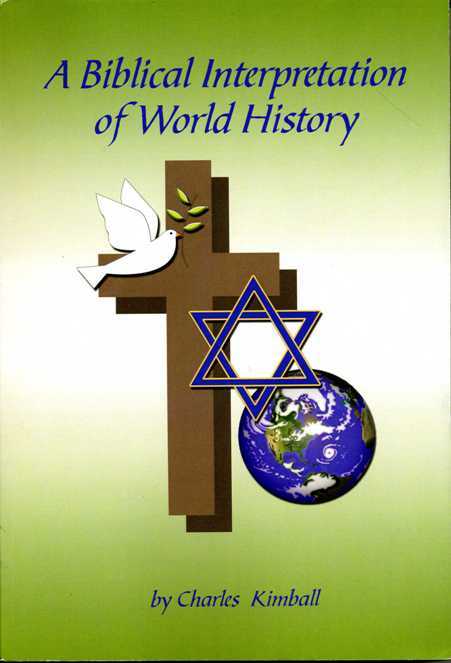 I’ve been reading at you history website for years and often refer it to the children of my friends as a reference for school. It completely blows my mind that you’re married to one of our countrywomen and that you too listen to Burning Spear.